A lazy weekend, a steaming cup of coffee and pancakes hot off the griddle. If that sounds like your idea of a perfect morning, you're not alone. Right now, pancakes are having a moment. People are calling pancakes the new "comfort carb" that they turn to when they need to stray off of their protein and broccoli regimen and eat something that makes them feel good. There's even a hashtag on Instagram, #pancakes, where people regularly post photos of their pancakes. To date, there have been 8.5 million posts. So, it's safe to say everyone loves pancakes. But, how much do you really know about them? Here are some pancake facts that might surprise you. Pancakes are as old as time. Ancient Greeks and Romans loved their pancakes, but it is thought they originated in the Stone Age. Archaeological researchers believe pancakes were a major source of food for prehistoric societies. The 5,300-year-old remains of "Otzi the Iceman," perfectly preserved in a glacier, were discovered in the Alps in 1991. What had he eaten for breakfast the day he died? Pancakes. Paleo pancakes are a thing. They're not just for the Stone Age anymore. Paleo devotees are getting their pancake fix with coconut flour, coconut milk, eggs, coconut oil, honey and vanilla. Kansas is flatter than a pancake. It's true. Some geographers with, apparently, too much time on their hands, used digital imaging to create a topographic profile of a pancake from IHOP and compared it with Kansas's topographic profile. This started something of a trend among geographers who have found Delaware, Florida, Illinois, Louisiana, Minnesota and North Dakota are also flatter than a pancake. Bonus fact: The term "flat as a pancake" originated in or around 1611. Speaking of IHOP, the iconic chain turns 60 on July 17. To celebrate, IHOP is serving short stacks of its world-famous buttermilk pancakes for just 60 cents at participating restaurants nationwide on that day from 7 a.m. to 7 p.m. IHOP recently was a hot topic with fans worldwide when it temporarily changed its name to IHOb to roll out a new lineup of quality burgers made with 100% USDA Black Angus beef. Pancake-lovers needn't worry; pancakes at IHOP aren't going away. During the publicity stunt, IHOP let customers know that pancakes are the chain's heart and soul, and at the center of everything they do. It's been that way for 60 years and will remain that way indefinitely. But, they added, now you can get its delicious pancakes with a big, juicy burger. The best of both worlds. Pancakes are universal. Pancakes are as iconically American as baseball and apple pie ... except they're not. Cultures around the world have pancakes in their cuisines. Here in the U.S. and Canada, it's buttermilk. Austria has kaiserschmarrn, a sort of deconstructed pancake eaten with raisins, apples and nuts. China? Mandarin pancakes, which are thin wraps. Eastern Europeans love blinis or blintzes and the French are famous for their crepes. That's to name just a few. If there's anything people the world over have in common, it's the love of pancakes. Pancakes for the Table (PFTT) is trending. It's all the rage in the New York dining scene right now. What is PFTT? It's the solution to the age-old brunch dilemma: Pancakes or eggs? Sweet or savory? Solve that riddle of the Sphinx by getting an order of pancakes for the table so everyone can have one with their cage-free, organic, egg-white omelets and acai mimosas. We call it Mardi Gras. The English call it Pancake Day. The Tuesday before Ash Wednesday in old England, people would use up all the eggs and milk in their households and make pancakes. It was a day of feasting and drinking, much like Mardi Gras, but without the beads. Pancakes have been in America as long as we've been a country. The first American cookbook, American Cookery, published in 1796, featured two pancake recipes. Back in the day, they were called hoe cakes, flapjacks or johnny cakes. Thomas Jefferson had a fondness for "panne-quaiques," essentially French crepes. 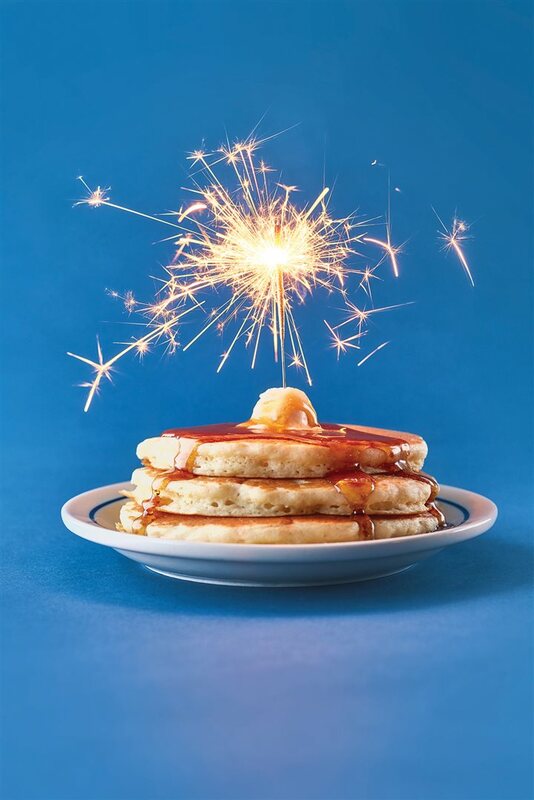 Now that you know all the facts about one of the world's favorite foods, put a couple of bucks into your pocket and head to IHOP on July 17 for a short stack for just 60 cents.